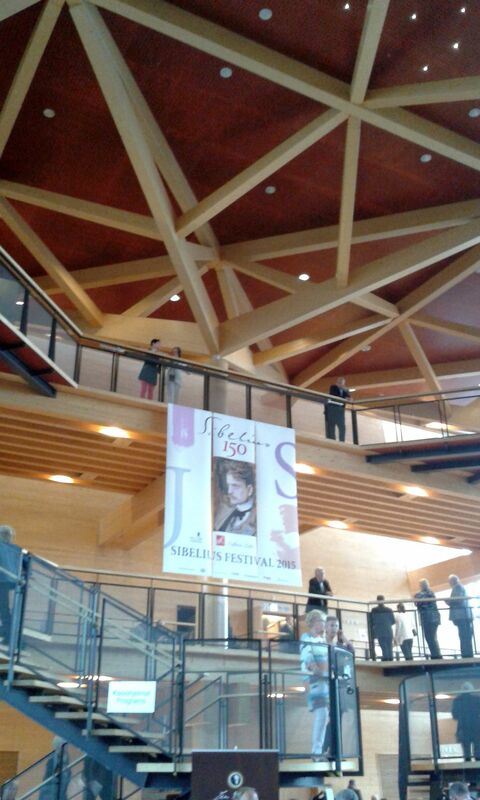 Finally I made it to Lahti to a concert in the famous Sibelius Hall. We bought the tickets already in February, the concert was sold out in April: BBC Orchestra from London directed by Okko Kamu with Sergei Malov as violinist. They played Violin Concerto and 2. symphony of Jean Sibelius (ha, what else during Sibelius Festival), as a bonus a solo piece of Bela Bartok for Violin and Valse Triste by Sibelius. 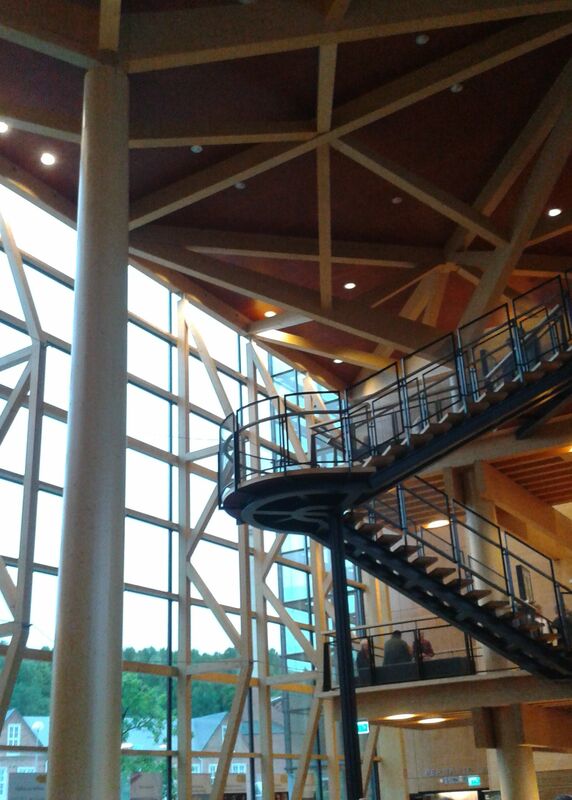 Sibelius Hall in Lahti is internationally renowned for its acoustics. Before the concert I wasn’t sure what to expect. Now I have a glimpse of what it is about (may be). Casually speaking, the building could be described as a “wooden box in a glass cube”. Educated culture vultures would call it more appropriately a masterpiece of modern wood architecture. Whatever the term, this hall has changed my understanding of “silence”; or broadened it. Generally I might have described “silence” as the absence of noise or sound. But when entering the hall I had the feeling that silence means something altogether different here. Silence in this concert hall is the “anticipation of sound”. As if the hall was filled with a velvety, invisible substance that (who?) was getting ready for tone and sound to be born from it. That’s how it felt to me. In the morning on the same day I had visited the Sibelius monument in Helsinki with a sightseeing group, it’s almost standard for tours in the Finnish capital. Again and again I get asked the question what the sculptor Eila Hiltunen might have had on her mind when welding the 600 pipes. I am careful to never give an explanation. During the concert I got some kind of an answer for myself at least. When the first tones emerged from the violin, I felt as if I was sitting inside the mind of Sibelius himself. It must have felt like this for him. His mind was just like the monument, a piece of art with hundreds of open channels for music to “thrust herself” through him onto the music paper. I have always wondered about composers, where the music comes from. May be it is not that they produce it. It’s more that the music is already there, somewhere, imperceptible for regular folks, in spheres of consciousness that only composers can reach. Sibelius was born to write down exactly this music that emerges from Finnish nature and helped to forge the Finnish nation. Even more fascinating to me was an impression that the hall allows for (facilitates?) a razor-sharp portraiture of the totality of a symphony as a multi-layered art process. The words “arid and pure” might describe the acoustics best for me. It reminded me of those freezing cold, bright winter mornings in Finland, when all humidity has been extracted from the air (makes your skin develop lines on the spot!). There was no reverberation, no soft-focus, each tone could be heard clearly and the birth process of the symphony as a whole was tangible all the time. 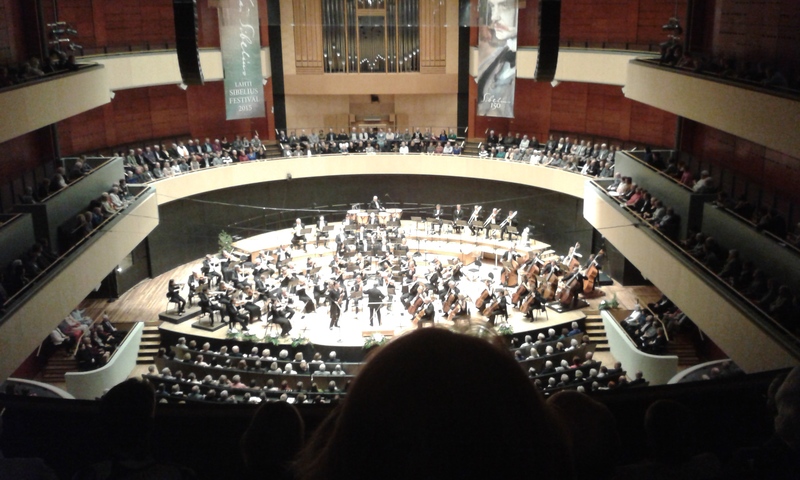 I know this sounds gobbledygook, I am not a poet, but in comparison to other concerts I have been to, the sound in the Sibelius Hall never detached itself from the orchestra. The symphony filled the center part of the hall like an enormous field of sound. At any moment, however, it was tangible how the composer’s mind received the music and brought it ontothe music rests of the orchestra from where the sound is born. And each musician remained clearly discernible. Every single movement of fingers, each breath, anything contributing to the art of sound was present, all the time. This must have been the consciousness of the Finnish conductor Okko Kamu, the hall functioning like a mirror of anything happening in a concert. In a sense, I think this hall is merciless to musicians and conductors. It produces a precise “cast” not only of the performed audio, but also of the consciousness of the artists in the room – the smallest mistake is adamantly perceived – but there were none, mistakes. At least I couldn’t perceive any. Unfortunately I haven’t found a recording of the violin concerto with Sergei Malov. So here is a recording with Maxim Vengerov and Daniel Barenboim, Chicago S.O. Sibelius violin concert. It’s not the same, though, but hey, still great.